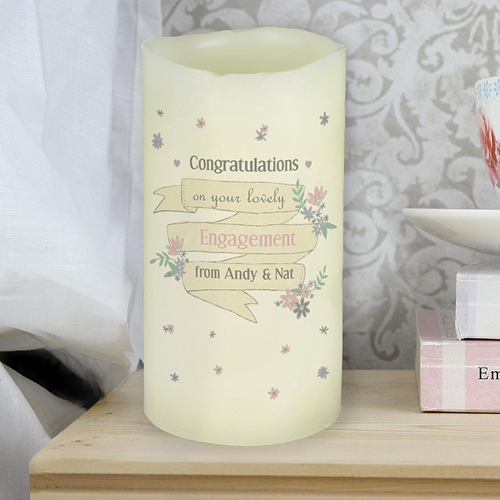 You can personalise the front of this Garden Bloom LED candle with 4 lines of text up to 15 characters per line. Lines 1, 3 & 4 are case sensitive and will appear as entered. Line 2, due to the font type used, please refrain from using all capitals. Ideal for Birthdays, Thank You Gifts, Weddings, Mother's Day, Christmas, Christenings. Persoanlise with 4 lines of text up to 15 characters per line. Lines 1, 3 & 4 are case sensitive and will appear as entered. Line 2, due to the font type used, please refrain from using all capitals.